Brendan Peter Schaub was born on 18 March 1983, in Aurora, Colorado, USA, of Italian, English and German ancestry. He is a retired professional American Football player, a former member of the Buffalo Bills practice team and a former mixed martial artist. Schaub is also a podcaster and appears on various shows. So how rich is Brendan? According to various sources, his net worth is estimated to be over $3 million as of early-2016. Without any doubt, his wealth can be associated with his professional martial arts career and the many competitions and championships he has participated in. Shaub’s parents Peter and Debra Shaub raised him in Colorado where he attended Overland High School. Brendan began playing football while in high school and continued playing it while studying at the University of Colorado. He graduated from the college with a degree in sociology. He then joined the Utah Blaze and played in the Arena Football League right after college, and also began to practice with the NFL’s Buffalo Bills team. Furthermore, Shaub has taken an interest in martial arts since retiring from football. It doesn’t come as a surprise since his father is a 2nd degree black belt in Karate and Tae Kwon Do. Brendan began boxing and after only half a year of training, he won a Golden Gloves title. By that time, he was also practicing jiu-jitsu, and after a short period of time was awarded a purple belt. Later, he achieved a brown belt in Brazilian jiu-jitsu. Before starting his professional career, he had been teaching boxing and working as a personal trainer. 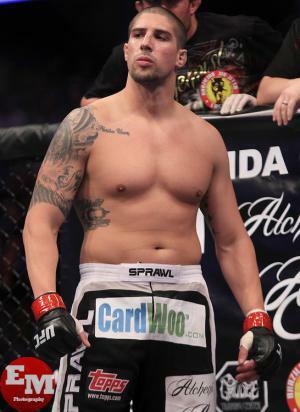 Schaub‘s MMA debut was made in 2008, defeating Jay Lester in ROF. One year later, he won the Ring of Fire Heavyweight Championship after defeating Bojan Spalevic. Shaub appeared in the tenth season of the reality television series “The Ultimate Fighter”, defeating Demico Rogers and John Madsen in the quarterfinals. In the semifinals, Schaub defeated Marcus Jones by knockout in the first round. These victories led him to The Ultimate Fighter: Heavyweights Finale where he fought against Roy Nelson, however, Brendan lost by knockout in the first round. Brendan’s other accomplishments include award for the First heavyweight fighter to finish via D’arce choke in UFC history and Knockout of the Night. For sure, “The Ultimate Fighter” has not only brought him recognition but also gained a big part of his net worth. Brendan has stated that his favorite grappling technique is a flying arm bar and his favorite striking technique is a Superman punch. Additionally Brendan is co-host with Bryan Callen of “The Fighter and the Kid” on Fox Sports, which is a weekly MMA podcast. “He is also a frequent guest on “The Joe Rogan Experience”, as well as appearing in “Mythbusters”, season 15, testing video games. In his personal life, he dated martial artist and UFC champion Ronda Rousey in 2013-14, but now he has a son with Joanna Zanella, Tiger Pax Schaub, who was born in 2016. 1 He has German, Italian, and English ancestry (his mother is from England).